Flow is one of the most basic yet critical elements of teamwork. Flow is the degree to which we feel we have enough challenging and meaningful work without becoming overloaded. It’s where productivity, energy, and performance are highest. Flow is when we’re accessing our best ideas, seeing creative solutions to problems, supporting one another, and getting a lot done. Most businesses are not harnessing anywhere close to the true potential of their people and this loss of passion and productivity costs us dearly. The happiest, most productive, and successful teams have one thing in common: they frequently achieve flow. ‘Teamwork’ has always been on the list of training courses for companies in one form or another. However, each person in your organisation is different and one-size-fits-all solutions are usually not effective. You still experience tension, conflicts, low energy, frustrations, and a lack of cohesion within and across your teams, causing road blocks and sometimes huge financial losses. Teams end up operating in survival mode rather than optimising their full potential. If you rely on the annual one-day team-building event or the weekly Friday-night-drink shenanigans to magically unite your teams and resolve all troubles, these may go some way towards fostering good social relationships between people, but they’re unlikely to have any real impact on their performance, productivity, or fulfillment. The burning questions are still top of mind: why do we work well with some people or on some projects and not others? Why do we get frustrated and impatient when other people don’t meet our expectations? Why can’t others see the big picture (or nitty-gritty details) as we can? Why do some tasks drain our energy leaving us exhausted, while these same tasks leave another person revitalised and wanting more? If you just ‘try harder’ next time, with the same people in the same roles and a focus on improving these ‘weaknesses’, it is like digging for water in a dry desert. What if we could stop trying to squeeze ourselves into boxes that we just don’t fit into comfortably? What if we could dig where the river is already flowing? Some of us, for example, are naturally creative and see the big picture ‘from above’ (think Google Earth), and we naturally suit the strategy and innovation games. 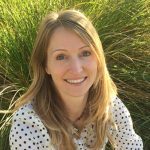 Some of us are inherently great at sensing the right timing and navigating the small obstacles at street level, and so suit project management roles (even though we may not yet realise it). If you try to put the big-picture guy in charge of the day-to-day planning of timing and outcomes (which most likely involves a spreadsheet or two), he may do it with a struggle, but you’re unlikely to get optimum results. Companies usually expect every salesperson to generate new sales leads and create repeat business, with no regard for some being far more talented at creating new relationships and others being better at maintaining and nurturing existing ones. It was a paradigm shift for me when I discovered Talent DynamicsTM as a way of learning and ‘tuning into’ the natural (and diverse) strengths and talents of myself and each person in my team. We realised why, despite working really hard and being exhausted, we hadn’t been performing at optimal levels or achieving optimal results. We found where we each fit best and feel most comfortable in the team or on a project (and it wasn’t always where we thought it would be or where we had been channeling most of our energy). With a deeper understanding of our own talents, leadership styles, and preferred ways of working, none of us has to feel guilty now about not being great at things that just aren’t ‘our bag’ – instead, we know who will do those jobs much better than us and actually enjoy them. When we allow someone to focus and channel their energy into what is most natural for them, and encourage and support them in these areas, the level of trust, reliability, performance, and fulfillment is multiplied. This is when we achieve FLOW. The experience of seasoned business professionals – and many successful sportspeople – is that when they are consistently playing the game that suits them, whether it is creating incredible new products, putting together million dollar deals, or taking care of the details through incremental rather than disruptive change, they reach a stage of mastery that accelerates performance dramatically. Getting your people into flow not only increases their fulfillment and wellbeing but can unlock the potential that exists within their team and your business, adding hundreds of thousands to your bottom line. When in flow, we are so focused and involved in our work that we lose track of time. We may even forget to take breaks. Not only does time fly but, when in flow, we usually work faster and get a lot more done in the given time than you might expect. The work will likely be of higher quality. Adults who spend more time in flow also spend more time working at the office, rather than gossiping, reading the paper, surfing the Internet, or other ways of avoiding work. When in flow, we are more in tune with our experience and natural strengths and passions so it’s vital to make sure we get the right person making the right decision about the right thing. Basically, if systems and processes are not our natural strength, we can’t rely on ourselves to make the decision about which accounting software our company is going to use. An individual in flow may be working hard and being productive but they will do so in their stride and not feel stressed or drained. In fact, they will enjoy the work and feel energised during and after working on the task. Flow makes us feel competent and ready to take on the challenges in front of us. It directs our focus outward, rather than inward on our worries, fears, and frustrations. Focus is associated with the crucial skill of better emotion regulation. Top executives report being five times more productive in flow, a McKinsey study found. 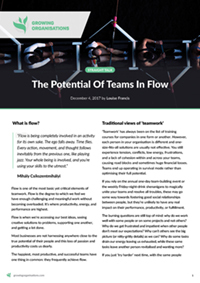 Not only does an individual perform at their best when in flow but a carefully selected team with each contributor working to their natural strengths will usually outperform a randomly formed team. In flow, our brain waves shift from the beta waves of concentration to the alpha waves associated with rest and relaxation and the theta waves that occur during meditation. And theta waves are the gateway to creative genius, a prerequisite for those ‘aha’ moments of insight. Because the act of achieving flow indicates a substantial mastery of a certain skill, the individual must continually seek new challenges and information in order to maintain this state. Flow also enhances learning because it releases dopamine. Dopamine not only gives us a sense of excitement but also helps us notice more patterns in the environment by heightening our attention and decreasing distractions. Although when experiencing flow it appears we are not really aware of any particular emotion, people who have discovered their natural strengths and experience flow regularly are happier people overall. In one study, people in flow also tended to feel cheerful, strong, active, concentrated, creative, and satisfied. Self-esteem also increases after a flow experience, and people who are in flow more often have higher self-esteem overall. This is one of the biggest benefits of having your teams working in flow. When someone is doing what they are naturally inclined to do and even can’t help doing, you can always trust them to do that thing and to do it well. If you are having difficulty trusting someone to do a particular job, chances are that’s not where their natural strengths lie. By discovering natural strengths and passions, and delegating tasks accordingly, you will be able to build a high-trust culture. Business is like a game. We play in teams. Yet everyone is often playing by different rules, so no one ends up winning. The Talent Dynamics business development tool enables you to become clear on the game you are playing, and to align your team to win that game. The more you play the same game, the better you get at it. First you must take some time to reflect to gain clarity on where you are right now, what your own natural strengths and passions are, and where you should focus your energy in order to leverage your talent and value. When you understand your own natural strengths and talents, you can go through the same process with each member of your team. Discover what activities and tasks get each of your members into flow and re-distribute them accordingly. You will be surprised how a small change can make a huge difference. For more information on how you can increase the performance and fulfillment of your people and accelerate trust, flow, and growth through our Team Dynamics Programme (taster sessions available), contact the Growing Organisations office.